Should You Stop Sealing Concrete? Tommy Cook’s professional background was in finish carpentry and other construction trades. But about 10 years ago, his wife asked him to build an indoor fountain. While researching the project, he met a woman who told him her husband was looking for an apprentice to help make concrete countertops, fireplaces and architectural details. Intrigued, he visited the facility and was so taken with the process, he turned his back on carpentry and started learning how to create custom decorative and architectural concrete products. After about a year, he struck out on his own, setting up shop in a garage with a couple of employees. And he began building a reputation for striking artistic vision combined with excellent craftsmanship. The business grew, and Cook eventually landed a client who became a partner. Steve Silberman had moved to Washington from California and was in the midst of a complete renovation of his waterfront home. He and his wife, Tina, wanted something truly distinctive. Ordinary granite counters just didn’t do it for them. Stainless steel wasn’t going to fly, either. Then the contractor suggested they consider Cook’s concrete business, and Steve balked — he didn’t want a sidewalk in his kitchen! But after visiting the operation, Steve was sold. Cook designed a backsplash that mimicked the Silbermans’ kitchen-window view — the Olympic Mountains, up to the lights of Victoria, Canada. From that point, the men’s relationship evolved from contractor-and-client to co-founders of Absolute ConcreteWorks. Cook says the business has enjoyed growth of nearly 300 percent in each of the last three years — a trend the partners believe will continue, even in a softening construction environment, because of the ever-growing visibility and demand for decorative concrete products. And to accommodate that growth, the company now uses 10,000 square feet of manufacturing space, with another 30,000 square feet outside. Total employment averages about 10 people, and varies according to workload. A good part of that growth can be attributed to ACW’s focus on customer involvement. Their clients are encouraged to become actively involved in the process. For example, Silberman says, a client might come to the facility with a contractor or designer in tow, along with a particular color or material sample they want. ACW then sets out to replicate the client’s concept in concrete. ACW is able to go further than many other companies to accommodate the design objectives of architects, interior designers and clients. The partners attribute this to a combination of their uncompromising commitment to client service, leading-edge designs, and an ongoing investment in state-of-the-art machinery. How flexible can they be? ACW has employed everything from coins collected during world travels and Harley-Davidson parts for a motorcycle fan to wild grasses, ferns and leaves culled from an owner’s property. “That level of personalization makes us more versatile,” Cook says. Technical proficiency and the proper use of materials — particularly glass-fiber reinforced concrete (GFRC) — enables ACW to pull off some unusual projects. 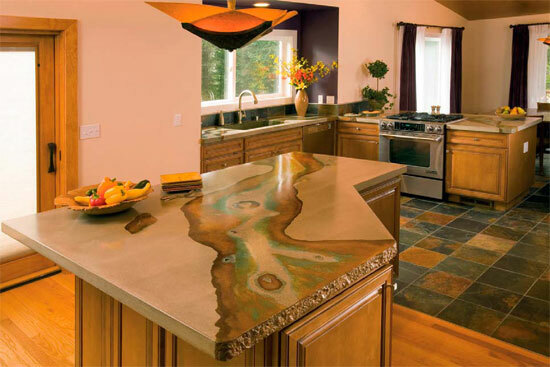 A recent countertop project was cast in a single piece and carried in by just four people. Not too impressive, you say? Consider this: the slab measured 11 1/2 feet long, 40 inches wide and 2 inches thick, and included a knockout in the center for a cooktop! In another job, a 14 1/2-foot-tall fireplace was cast in Washington, then shipped to Oregon for installation. Each 3/4-inch thick piece was about 6 feet wide and 4 feet high and suffered no cracks, fissures or other problems during transport. ACW is poised for even greater growth. Originally, product was mixed in 5-gallon buckets. But the company’s continued expansion gave Silberman and Cook the impetus to improve the facility. Cook is confident about ACW’s future. As more and more people realize that concrete is an extremely versatile building material — “It’s not your father’s driveway anymore,” he jokes — manufacturers are developing a wider range of sealers, additives, colors and other products.